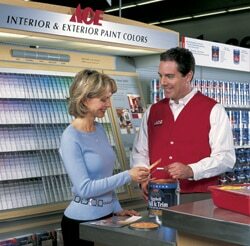 When you have a home repair or improvement project, think of your local Bill’s Ace Hardware first. You will not only find the product you need, but also an experienced service person in every department to help solve the trickiest of home repair problems. Through the years the name and locations have changed, however, since 1948 we have continued to provide world class service. We have empowered every employee that works for Bill’s Ace Hardware to make the decisions that need to be made to make excellent service happen for you. If, at any time, you are not satisfied with our service, we want to know so we can make it right. We stock more than 40,000 different items and have access to more than 100,000 items available from Ace’s million square foot warehouse in Sacramento. If the product you want is available in our chain, we will have it for you before the day is over! All Stores carry environmentally friendly products including LED’s, and Safer® garden products, and natural cleaning products along with many other products. We also carry water crates, barrels, and drums for all your water recycling needs. In addition, we pride ourselves in our Green Business Certification and try to use environmentally friendly business practices everyday. Also, you can drop off your used household alkaline and rechargeable batteries in any of our stores. When visiting Bill’s Ace Hardware Concord store on Clayton Rd., take the time to peruse the outdoor living section for furniture, fire pits, lighting and many more outdoor items. You won’t believe the choices in Weber® BBQ’s or the newest outdoor cooking trends with Green Mountain® and Traeger® pellet BBQ’s or the KAMADO JOE® Ceramic Cookers. Don’t let the size of Bill’s Ace Hardware Pleasant Hill store on Contra Costa Blvd. deceive you. If they don’t have what you need in stock, they have access to the inventory of all of our stores at their fingertips. Bill’s Ace Hardware Martinez is the Business2Business supplier of our chain. Located within the industrial business district of Martinez, we not only stock residential hardware products, we stock the “the big stuff” too! ACE Truckbox Center is the supplier for all your truck, van and towing accessory needs. We carry a large selection of products from Weather Guard®, Knaack®, Draw-Tite®, Delta®, Rack-It® and many others. Visit Bill’s Ace Truckbox Center at 3550 Pacheco Blvd. in Martinez or give us a call at (888) 379-0828 or (925) 228-6136 local. Stay in touch with what Bill’s Ace Hardware is doing now, follow Bill’s Ace Hardware on Facebook.